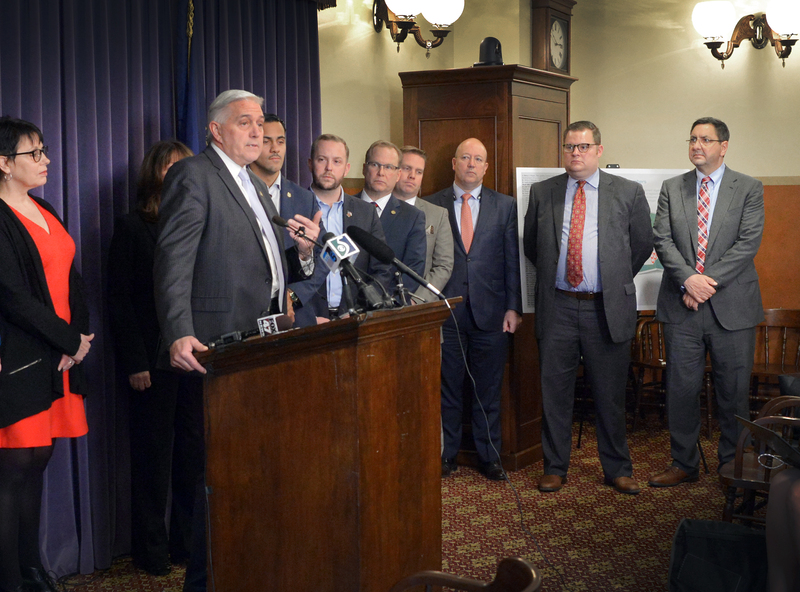 LANSING, Mich. — State Sen. Ken Horn was joined by four Senate colleagues on Tuesday in introducing legislation aimed at transforming abandoned buildings, contaminated sites and other difficult-to-develop properties throughout the state. There are a number of these sites, known as brownfield properties, throughout Michigan. However, they are often viewed as unfavorable to developers because of the costs associated with restoration and redevelopment. Senate Bills 111-115 would build on the current Brownfield TIF Act to create a new category specifically for major projects that could revitalize major sections of land. The bills would allow a project to keep a portion of the new tax revenue it generates in an effort to close the gap of redevelopment costs for contaminated, blighted or abandoned sites. The rest of the revenue would go to the local government and the state. Because these sites were not producing any revenue to begin with, everyone benefits. This approach is entirely performance-based and puts the risk entirely on the private sector. The developer must put up the capital, build the project, and fill it with people and jobs that generate new revenue. If the project does not generate the expected tax revenues, that risk is entirely on the developer – not taxpayers. Also, because no money from the state is put toward upfront costs, things like the School Aid Fund, local revenue sharing, road and bridge funding, among other programs, are all protected. In order for investors to be able to receive a portion of the increased tax revenue, certain requirements must be met. Projects must first receive local approval, must be mixed-use development, have a minimal capital investment based on the population of the community requesting the development and have the project’s tax capture approved by the Michigan Strategic Fund. The projects must also provide evidence that the redevelopment will be beneficial to our state. JoAnne Crary, President and CEO of Saginaw Future, who has worked closely with Horn on similar legislation in the past, argues that revitalizing these properties protects the environment, reuses existing infrastructure and creates economic opportunities for both local governments and residents alike. Dan Austin, spokesman for the MIThrive Coalition agreed that the bills have the potential to completely revitalize communities. Horn remained optimistic that these bills will be able to revitalize entire communities. SBs 111-115 were assigned to the Senate Committee on Economic Development and International for further consideration. Editor’s note: A print-quality photograph is available by clicking on the image or by visiting the senator’s website at: www.SenatorKenHorn.com. Click on “Photowire” under the Media Center tab. Video is also be available on Horn’s website under the “Video” tab. Photo Caption: State Sen. Ken Horn, R-Frankenmuth, stands at the podium with members of the MIThrive Coalition and his Senate colleagues during a press conference introducing the newly updated MIThrive initiative in Michigan.